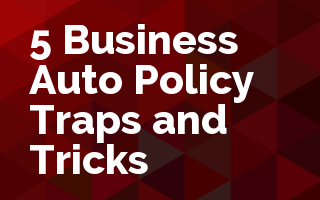 This webinar will identify five “traps”, or coverage gaps, in the ISO Business Auto Coverage Form CA 00 01 and recommend “tricks” – optional endorsements and other actions – that can be used to avoid those “traps”. This webinar will identify five “traps”, or coverage gaps, in the ISO Business Auto Coverage Form CA 00 01 and recommend “tricks” – optional endorsements and other actions – that can be used to avoid those “traps”. Those optional endorsements and key paragraphs of the “Who Is An Insured” provisions of the Covered Autos Liability Coverage section of the CA 00 01 will be examined in detail.